Periodontal disease is all too common in our pets. In general, a cat’s breath typically doesn’t smell bad. 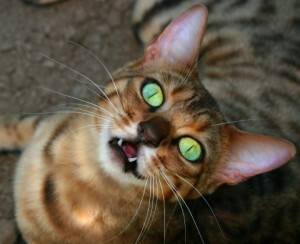 If your cat has halitosis, otherwise called bad breath, it is a sign that there is something wrong. Is your cat chewing with just one side of his or her mouth, or is he or she dropping the food often while trying to eat it? These kinds of eating changes could be a sign that your cat is experiencing pain while chewing. Have you noticed that your cat is reluctant to eat his or her food? If so, this could be a result of pain or irritation in the mouth. If you find that your cat is drooling or salivating more than normal, this could be a sign of dental disease, especially if the drool has blood in it. If you cat is pawing at his or her mouth, it is probably because his or her mouth is irritated. At Sun Valley Animal Center, we are probably best known for our pet surgery in Boise, Salt Lake City, Spokane and Billings, but we offer so much more. Now that you know the signs of dental disease, it’s time to learn about why teeth cleaning is so important. Stay tuned for our next blog to learn more.